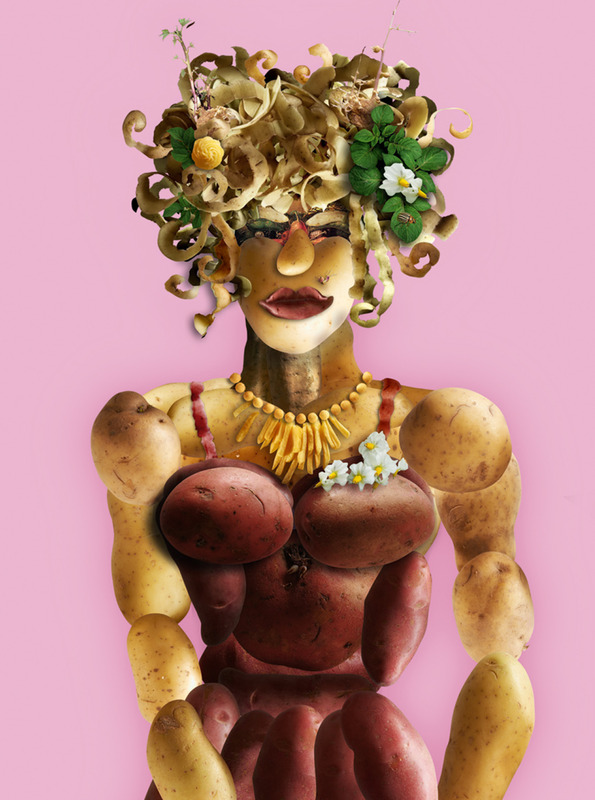 2012, the foundation De Bildtse Aardappelweken organised for the second time the “Bildtse Potatoweeks”. In 2008, the International Year of the Potato” was the first version. The province of Fryslân, of which het Bildt is one of the counties, is the hard-land of the Dutch seed-potato production. The potatoes are exported to very many countries all over the world, feeding many people with an high nutritional value using only a small amount of fresh water. Goal is to inform the consumer about where his food is coming from, but also colleagues and businesses about how the modern agricultural farms are run. With an unorthodox presentation: different aspects of farming in combination with art, visitors get to know the farming-world. Between worlds that normally spoken do not meet each other: the agricultural and art world, a cross-over begins. Because the presentations are presented next to each other both worlds attract a different audience. The exhibitions are shown on 6 different farms in the county. Next year the art is coming from both local artists and Irish (Dublin area). Please look for the names of the artists and locations in the chapter: tentoonstellingen. This symposium is meant solely for the seedpotato-farmers, the seedpotato-business and -organisations and governmental institutions. From the first symposium we learned that also the agricultural press is very interested in our program. The theme of our symposium is “The potato worldwide”. Ireland is traditionally one the European potato-countries. The circumstances under which our potatoes grow and are traded are comparable to those in Ireland. Farming families in the area invite you to come to visit their farms and join them for the lunch. Under the label “Waddengoud” a group of producers of high qualified local products joined together and present themselves, with local producers, in a product market. Films with a connection to the themes from the Netherlands and Ireland are shown. Also a contest of beginning, still studying, professional filmmakers is part of the festival. Visitors are welcomed in a potato-warehouse and will be confronted with the questions of young people: do I leave or can I stay and how can I make a living in the rural area today and in the future? Part of the performance is a journey through the fields in which the story of Brendaan, who made a journey in the 10th century across the Atlantic Ocean, is the lead. Primary school children together will make at school under the lead of an artist a round panorama-painting of the area.